The moon Ariel is one of the five main satellites of Uranus. With a diameter of 720 miles, it is the fourth largest of all Uranus's moons. It lies 118,694 miles out from its planet, which it orbits in about 2.5 days. 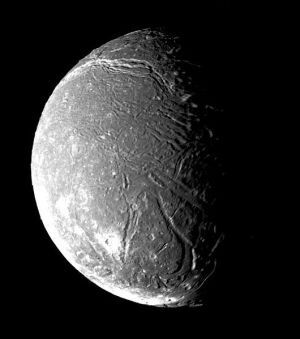 The moon Ariel seems to have quite a high density, compared to the other main moons, which leads to the supposition that it is comprised of equal parts water ice and other material, such as silicate rock or organic compounds. Like Uranus, this moon has its axis tilted 90 degrees, so that, every 42 years, one of its poles is pointing directly towards the Sun. This results in extreme seasonal variation, in the same way as its host planet. The image above shows very prominent canyons carved into Ariel's surface. These are huge features, the longest being Kachina Chasma, which extends for around 400 miles. They can be up to 30 miles wide and their floors are convex, like the camber on a road, with the middle rising up over a mile. It is thought they were formed as faults in Ariel's crust as a result of water freezing in its interior. Most of these seem to be in the moon's southern hemisphere, criss-crossing the moon's "cratered terrain", but extensions of them extend further around it. These take the form of huge ridges and form the moon's "ridged terrain". These gigantic features occur in bands, separated by troughs. Such objects can be 125 miles long and up to 45 miles wide. Within them, the ridges are spaced, on average, at 14-mile intervals. The "cratered terrain", centred around the moon's south pole features relatively small craters. The largest, Yangoor, is only about 50 miles across. This leads scientists to believe that the moon Ariel must have been completely resurfaced since its formation. There are traces, however, of "palimpsests", which is the name for a former crater that has degraded so much that it has completely faded into its surroundings, leaving a ghost image. One such is 152 miles across. 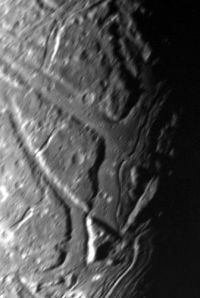 A closeup of Ariel's surface, clearly showing the criss-crossing canyons.